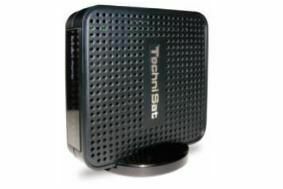 TechniSat launches new USB HD satellite receiver for PCs and laptops | What Hi-Fi? What's more, with the addition of a free download from the TechniSat website it will even convert services such as the Astra 3D Promo channel into 3D video viewable using red/cyan anaglyph glasses. As the name suggests, the SkyStar USB HD plugs into a USB port on a laptop or PC, and is compatible with Windows operating systems up to Windows 7. Capable of receiving DVB-S2 high definition broadcasts, it works seamlessly with Windows 7/Windows Media Center, and comes complete with TechniSat's DVBViewer TE2 software for use with other versions of Windows. As well as allowing recording to the computer's hard disk, the package allows timeshifting, and recordings can be edited used the bundled EVE v2 software.